Goldrick - "I am not going to get over it any time soon"
Dublin TG4 All Star Sinéad Goldrick is still heartbroken after another failed bid for All-Ireland senior club glory with Foxrock-Cabinteely - but she is hungry to put things right with her county. Manager Mick Bohan has retained eight of the starting 15 that secured a second successive TG4 All-Ireland senior title against Cork last September but Dublin will have to do without Goldrick as the wing-back is currently on the comeback trail with tendinopathy in her hamstring after a long 2018. Dublin secured their third Brendan Martin Cup with a 3-11 to 1-12 win over Cork at Croke Park on 16 September. But Goldrick was soon back on club duty and that ended in a 1-13 to 1-6 loss against Mourneabbey on 8 December at Parnell Park. “We had the All-Ireland final, the week after was the semi-final of the county, and we had five games in a row after that,” said Goldrick. “Having won an All-Ireland with Dublin that feeling we haven’t had it with our club yet. You do view it separate but having tasted it you want the club players to taste that feeling of success too. “It is probably a bit more disappointing that we lost because all of our club players have been training just as much over the years and they haven’t tasted that yet. It was more disappointing having won it with Dublin and not with the club. 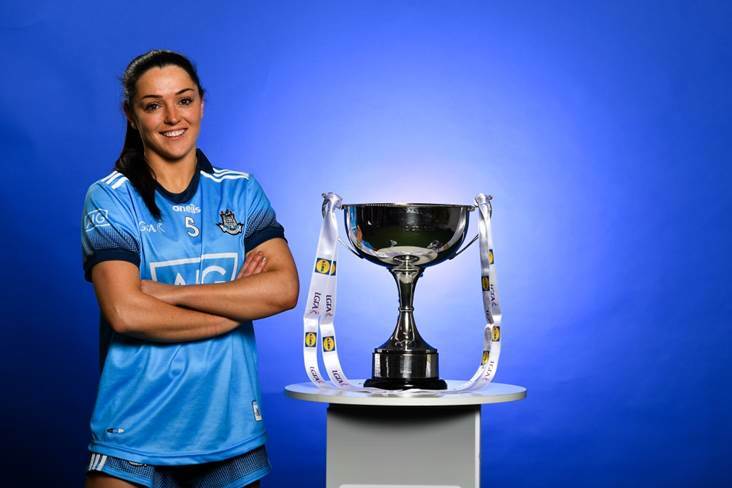 Goldrick was awarded her sixth All Star in seven years in December but knows she will have to earn her place in the Dublin team all over again. Missing out this weekend is hardly ideal, but she is ready to fight for her spot. “Everyone in the camp wants to be on that starting team and they are pushing. Training has been intense especially with the new players coming in, it’s good because it keeps everyone on their toes,” said Goldrick. “It is a big squad. There are a few question marks over a few players coming back. But we are focusing on the camp and the players we have. We have about 40 who have been training. It’s a good strong panel. “It’s hard to benchmark ourselves until we start playing the league games. It will be good in terms of seeing how our levels of fitness are against Donegal and then Tipperary.